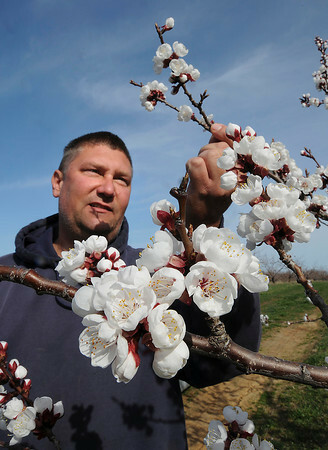 Youngstown, NY - Farmer David Tower of Tower Farms checks the blooms on an apricot tree in his Youngstown-Wilson Road orchard. Tower expects to lose some of his blooms because of the overnight freeze, but said it was too early to tell. Many flowering plants are susceptible to freeze damage when they bloom too early in the season, said Tower, including his apple, peach and cherry trees.